September 2018 www.coalage.com 25 blasting continued www.richwood.com Rely on Richwood! 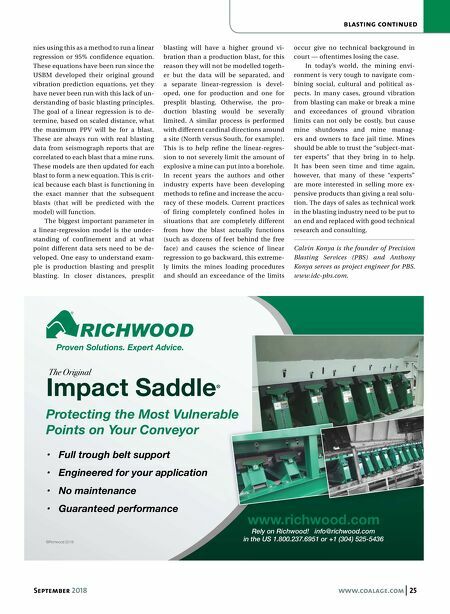 info@richwood.com in the US 1.800.237.6951 or +1 (304) 525-5436 Impact Saddle ® Protecting the Most Vulnerable Points on Your Conveyor • Full trough belt support • Engineered for your application • No maintenance • Guaranteed performance ©Richwood 2018 The Original Protecting the Most Vulnerable nies using this as a method to run a linear regression or 95% confidence equation. These equations have been run since the USBM developed their original ground vibration prediction equations, yet they have never been run with this lack of un- derstanding of basic blasting principles. The goal of a linear regression is to de- termine, based on scaled distance, what the maximum PPV will be for a blast. These are always run with real blasting data from seismograph reports that are correlated to each blast that a mine runs. These models are then updated for each blast to form a new equation. This is crit- ical because each blast is functioning in the exact manner that the subsequent blasts (that will be predicted with the model) will function. The biggest important parameter in a linear-regression model is the under- standing of confinement and at what point different data sets need to be de- veloped. One easy to understand exam- ple is production blasting and presplit blasting. In closer distances, presplit blasting will have a higher ground vi- bration than a production blast, for this reason they will not be modelled togeth- er but the data will be separated, and a separate linear-regression is devel- oped, one for production and one for presplit blasting. Otherwise, the pro- duction blasting would be severally limited. A similar process is performed with different cardinal directions around a site (North versus South, for example). This is to help refine the linear-regres- sion to not severely limit the amount of explosive a mine can put into a borehole. In recent years the authors and other industry experts have been developing methods to refine and increase the accu- racy of these models. 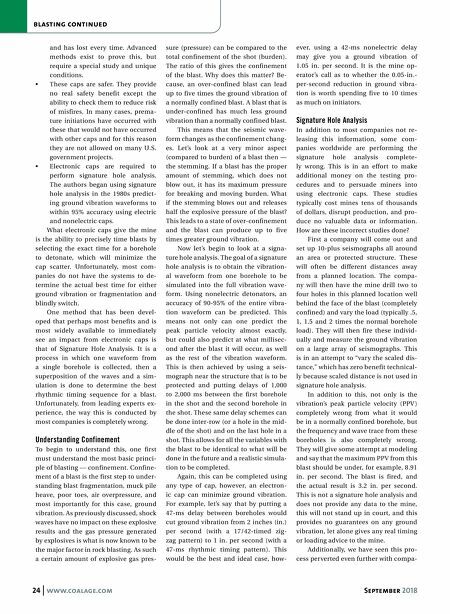 Current practices of firing completely confined holes in situations that are completely different from how the blast actually functions (such as dozens of feet behind the free face) and causes the science of linear regression to go backward, this extreme- ly limits the mines loading procedures and should an exceedance of the limits occur give no technical background in court — oftentimes losing the case. In today's world, the mining envi- ronment is very tough to navigate com- bining social, cultural and political as- pects. In many cases, ground vibration from blasting can make or break a mine and exceedances of ground vibration limits can not only be costly, but cause mine shutdowns and mine manag- ers and owners to face jail time. Mines should be able to trust the "subject-mat- ter experts" that they bring in to help. It has been seen time and time again, however, that many of these "experts" are more interested in selling more ex- pensive products than giving a real solu- tion. The days of sales as technical work in the blasting industry need to be put to an end and replaced with good technical research and consulting. Calvin Konya is the founder of Precision Blasting Services (PBS) and Anthony Konya serves as project engineer for PBS. www.idc-pbs.com.